It’s World Nutella Day 2015. That doesn’t mean the world (or your healthy lifestyle) has to be over. While Nutella lovers around the world rejoice in the glory of this velvety, chocolate-hazelnut spread, you’re sitting idly by your computer, wondering whether you can incorporate the beloved condiment into your day. Just this once. The answer is yes. Live in moderation. Make healthy eating part of a lifestyle, not a diet. Did you eat a lot of wholesome food this week? Eat some Nutella and savour it. Dip it wisely. The glycemic index of different types of food can influence your blood sugar. Fruits generally have low GI values and won’t make your blood sugar fluctuate as much (read: make the hunger real and trigger intense cravings). White breads, crackers, and other dippers that you generally associate with nutella have GI values on the higher end of the spectrum. If you’re gonna eat nutella with something, spread it on a piece of food that’s better for you! Savour it, don’t obsess over it. Have a tablespoon. Maybe a tablespoon and a half. But don’t eat the whole jar. Remember that nutella also has a lot more sugar than peanut butter does, and it contains tons of modified palm oil as opposed to natural fat. Balance it out. Ramp up your workout just a notch: run an extra kilometre, do a HIIT class, try a pilates video. Get up and move by doing something you genuinely love. Never hate yourself or punish yourself for indulging in anything. One tablespoon of nutella goes a long way. Diffuse the tablespoon into a recipe with other, better-for-you ingredients that’ll make you feel fuller for longer, and pumped for your next workout. 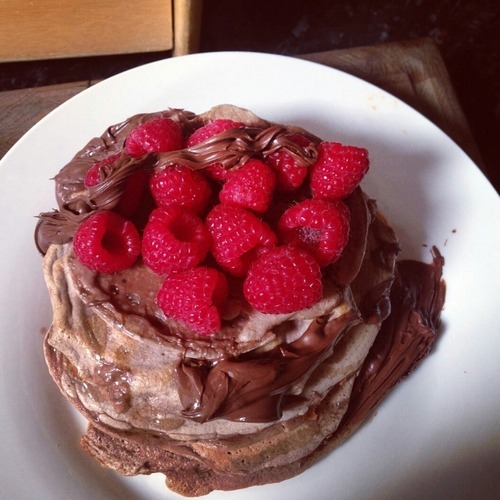 We love this protein pancake recipe, it’s genius!